For the sixth consecutive game, Chiefs quarterback Alex Smith outplayed the other team’s quarterback as Kansas City beat the Bills 30-22. I know, Alex Smith probably shouldn’t be the headliner of this win, although he threw several outstanding passes and Jeremy Maclin had his biggest day receiving for the Chiefs. I bring it up because it’s time we start re-thinking what this quarterback should be to this team. This isn’t your fantasy team. This is a real, living, breathing NFL playoff team trying to win games. And for the sixth game in a row, the Chiefs quarterback was better than the other guy. A common call to my radio show is one where a listener either asks or states where Alex Smith ranks among NFL quarterbacks. It’s usually summed up as, “somewhere in the middle, maybe 15th or so.” And that has a nice ring to it, and because we are so locked into fantasy numbers, it can easily be supported. But Alex Smith is about to have three winning records in three seasons in KC. His turnovers are off the charts low. He dives for the first down marker with the best of them to keep the chains moving and he’s a pretty good passer. Certainly a safe passer. Doesn’t that make him better than risky players like Tony Romo and Philip Rivers? Not on your fantasy team, in real games. Everywhere I looked this week I saw NFL teams LOSE games. Romo’s two pick sixes. Gifts. Philly was awful. And even the Patriots gave one away because of poor play calling and lack of execution by perhaps the greatest QB of all time. Yes, the Pats went all Andy Reid in that playoff game at Indy two years ago. Leading 21-7 in the fourth quarter, the Patriots would get a whopping five more possessions. Brady would, the rest of the game, throw 22 passes, and hand the ball off once! With a 21-7 lead. It’s crazy to watch team after team implode and give games away. It’s an epidemic in this league but it’s not happening anymore in Kansas City. The Chiefs blew two double digit leads at home earlier this year. One with turnovers and the other with bad offensive football after Jamaal Charles was carted off the field. That seems like 100 years ago. Now, even when struggling at the start, the Chiefs found something Sunday and racked up 30 points. During this five game winning streak, the Chiefs are averaging 32 points per game and have played long stretches of dominant football on both sides of the ball. And they haven’t turned it over. Not once. 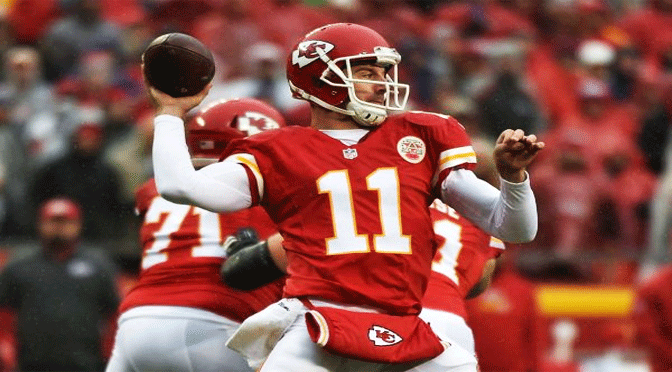 Now Alex Smith to Jeremy Maclin is starting to look legit and create some big plays. Complain away, hate on the screen passes, and keep talking about how the Chiefs don’t throw it downfield. But this is not a video game and it’s not your fantasy team. And remember this, the past five games the Chiefs have been as close to perfect as you get in the NFL. In everything they’re doing. Even their quarterback play. Alex Smith is a solid QB (anywhere from #7 – #17 on any given week over his career), but the question the Chiefs need to ask remains: down by 3 (or 7) with 2 minutes left to go in a Superbowl, can he lead the team to victory? Can he be elite? Because if we look at the SB winners over the past 15 years, it has been mostly top-flite, elite QBs (exceptions: Dilfer, B. Johnson, maybe Flacco, maybe R. Wilson).